conferencing, voice calls and integration with Google App services. For the uninformed, Easter Eggs are surprise tricks included in a program as a hidden fun bonus feature. This comprehensive cheat sheet of Hangouts easter eggs includes wacky cartoony animations, Ascii code graphics, hidden emojis and still working chat tricks with deprecated features. This list contains the comprehensive chat easter eggs for Hangouts. 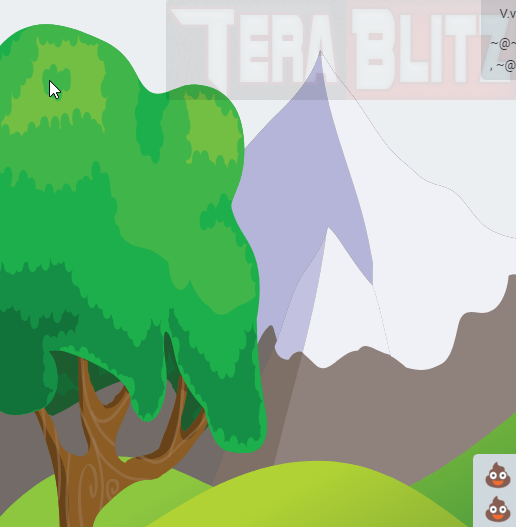 Press the keys up, up, down, down, left, right, left, right, then type-in b, and a. Lastly, press Enter and it will invoke this NES-like green background with an alps mountain and a giant tree. Type in /bikeshed then press Enter and it will change the text chat background to a random color. If you dislike the background color, restarting the chat client usually returns the background hue to the default color. 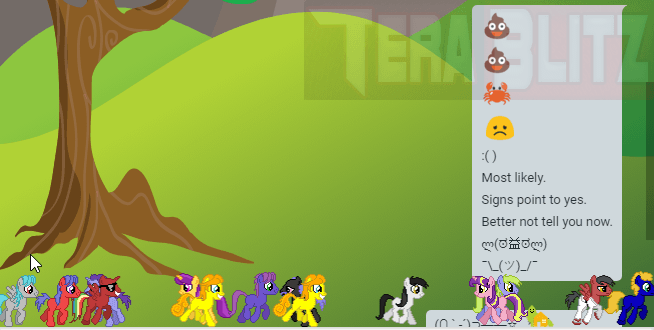 Type in /ponies then press Enter and it will render a cute-looking pony to gallop across the chat screen. Every /ponies chat entry calls a new pony. Type in /ponystream then press Enter and it calls the same pony characters but now in a seemingly unstoppable group parade. The number of ponies rendered may slow down your computer considerably. The usual antidote is to close and restart the chat client. 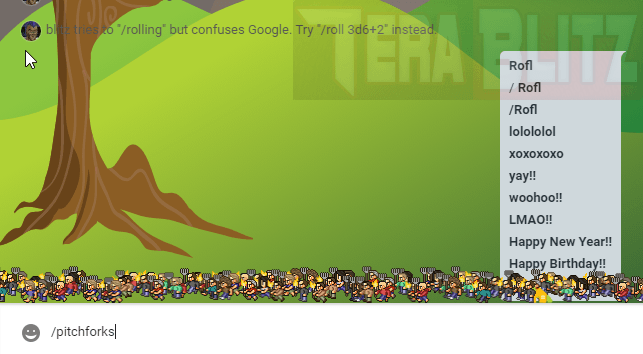 Type in /pitchforks then press Enter to activate this easter egg animation. The surprise trick brings an angry mob of torch bearing townsfolk running across the chat screen. Type in /pitchforksstreams then press Enter and it will renders the same animation as /pitchforks but may last for a longer while. If you opt to disable this resource hungry animation, restart your chat client. Type in /shydino then press Enter and it will show an orange house. Afterwards, a green-colored dino runs on the chat screen then stays behind the house. Type in /corgis then press Enter and it will show a running Corgi. Type in /tableback then press Enter. It will render a custom ascii code graphic. Type in /tableflip then press Enter and it will render a custom ascii code graphic. Type in /shruggie then press Enter and it will render a custom ascii code graphic. Type in /8ball then press Enter and it will post a random text answer. Type in /me then press Enter and it will show your google hangouts profile avatar. Type in /yuno then press Enter and it will render a custom ascii code graphic. Type in /happy then press Enter and it will render a custom ascii code graphic. Type in /disapprove then press Enter and it will render a custom ascii code graphic. Type in /shame then press Enter and it will render the triple bell emoji. Type in /this then press Enter and it will render a custom ascii code graphic. Type in /that then press Enter and it will render a custom ascii code graphic. Type in /facepalm then press Enter and it will render a custom ascii code graphic. Type in /puppyparty then press Enter and it will render a static emoji of several cute puppies. Type in /wizard then press Enter and it will render a custom ascii code graphic. Type in /lit then press Enter and it will render the triple flame emoji. Type in /flowerbeam then press Enter and it will render a custom ascii code graphic with flower emojis. Type in /roll 3d6+2 then press Enter and it will roll a dice and generate random value. Type in /rolling then press Enter and it will roll a dice and generate random value. Type in /rolls then press Enter and it will roll a dice and generate random value. Type in /roll then press Enter and it will roll a dice and generate random value. Type in [email protected]~ then press Enter and it will render a stinky poop emoji.